We are switching from DTV to Dish and I have spoken to Dish twice and both times I was told that I can not have a Hopper in a RV and that I need to have a Wally.. Is this true? I guess if so that's ok but I thought I had read that people DO use a Hopper in their RV and that the Hopper is a superior device over the Wally, am I missing something? Many people are using Hoppoer in RV usage. Whenever you talk to Dush representatives, it's a crap shoot if you will get one that knows RV options correctly. 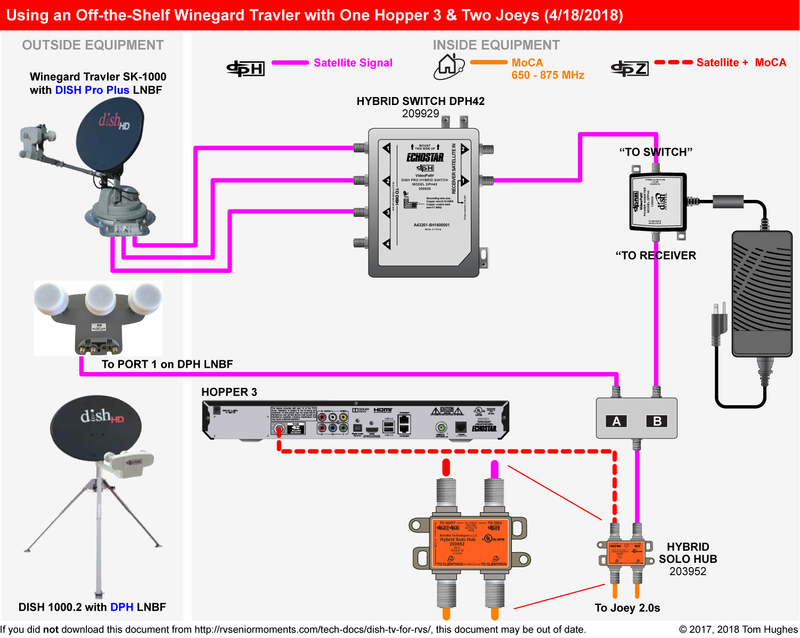 You need a Traveler or RF Mogal antenna with a Hopper. Go through a local sat TV installer, not DISH directly. I've had Hoppers (original, Hopper w/Sling, and now Hopper 3) in my RV since 2012. That's the key. A Hopper won't work with a dome antenna. I just fixed a guys Hopper/Joey installation today after the Dish installer couldn't complete the job. This is the first time I saw a Hopper/Joey set up. What a conglomeration of multiplexers, splitters, power inhibiters and 'stuff'. But it worked when I got done. Why do you want a Hopper/Joey? Why not just 2 receivers? Why not a VIP722 to record & playback? Especially if you have a dome; you can still get HD that way. but the real question - do ya have a Winegard Traveler? If it's DirectTV (and especially if it's a SWM model) you'll have a few expenses converting it to Dish; then it will be time to decide on receivers. I just fixed a guys Hopper/Joey installation today after the Dish installer couldn't complete the job. This is the first time I saw a Hopper/Joey set up. What a conglomeration of multiplexers, splitters, power inhibiters and 'stuff'. It couldn't be that complicated if you finished the install and it was your first Hopper install. Here's some specifics on the "stuff" used in Hopper installs . . .
IWhy do you want a Hopper/Joey? Why not just 2 receivers? Why not a VIP722 to record & playback? Why a Hopper? 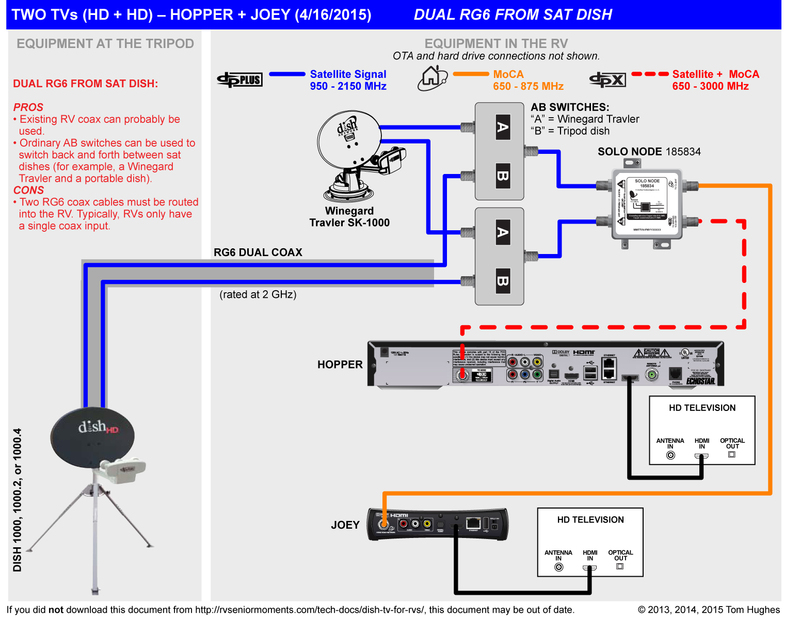 If it's a Hopper 3, then you have 16 tuners, whole-house DVR, PTAT, etc. BINGO!!!! And thanks for all of the replies. As soon as I contacted a Dish dealer OTHER THAN Dish directly and told them what I was after it was fast and easy. To answer a couple questions, we are having a New Horizon 5th wheel being built and are having the Winegard Traveler for Dish installed so no conversion needed. The Traveler we have on our current motorhome is staying with the coach. The new 5th wheel will have 3 TV's and we will have a Joey's at the bedroom and outside TV's which will be a step above what we have in our current motorhome with Direct but that has not been a problem because we tend to watch the same thing together anyway. But we decided what the heck, lets set it up so we can watch and record different things at each TV this time. So we will have about the same programing with Dish that we have with Direct and we will have more capabilities as far as watching and recording different things on different TV's at the same time, we will have a more sophisticated receiver and remote AND the best part is we will have a provider that allows us to change our current location for local stations much easier than we have been able to do with Direct, no more having to watch all of the hate & discontent in LA. Oh, and we will save a little money every month, at least for the 1st couple years. I used a Hopper 3 in our coach for a year. Would take it out of the house and put it in the RV when we needed it. My understanding is the reason that Dish doesn't want you to use the Hopper in the RV is fear the hard drive will crash while driving. So just unplug it before you move. Thank you for the info, tech writer. The dish guy installed the 'stuff' and got the Joey working. He couldn't figure out the coach wiring for the sending the hopper to the front and outside TVs tho. It was a hopper 3. Also, get some quality Belden 3 GHz RG6. It has everything to do with how much noise is inserted into the lnb Signal prior to it getting amplified in the receiver. If there is no concern with this in the switch great, that is what I was trying to determine. Notice that in the bottom diagram the description of the signal changes which might imply a higher level of noise immunity required in those circuits. It is my understanding that Dish requires greater than 2ghz capability in its sat cables from the dish to the receiver. If the switch is rated for that great. I have been unsuccessful finding info on switches. Thus the question.